It is with sadness that I realize I can no longer do any of my traditional baking… especially for Christmas. The tradition has lasted for 62 years! This will be the first year that I won’t be doing any. Shortbread, of course, Candy Cane Cookies, Almond Crescents, Peppercalker, Angel Wings, Birds Nests, and many more. I also made a sweet dough, and made Christmas trees out of it. I made gingerbread houses… from scratch… not a kit. The fence was candy cane cookies. The tree was an ice cream cone turned upside down.. 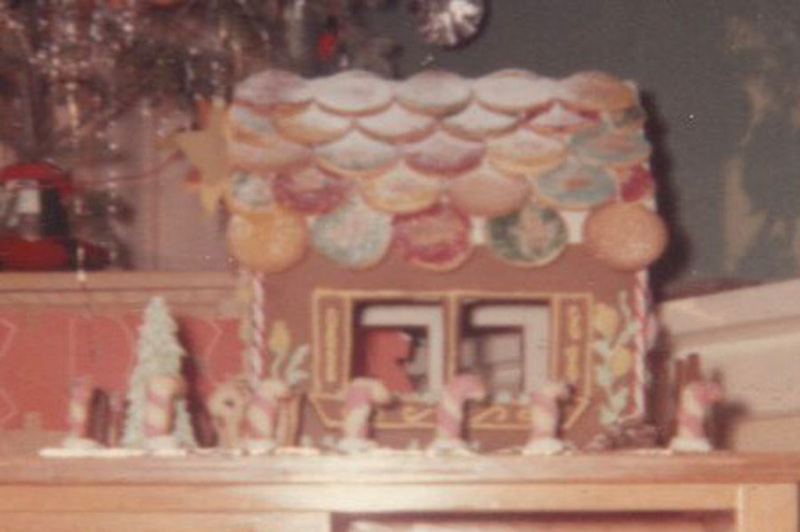 The shingles on the roof were sugar cookies, with coloured sugar on them. Every year each one of my sons got to take a decorated cake to school. I had to take it, and the principal would put it on a trolly cart and take me and the cake to every classroom! One Christmas Danny asked me to make a gingerbread house for his class party. I made a lot of extra gingerbread cookies and put them inside the house so there would be plenty for all. Danny never ate any of the other goodies that were there… he was waiting to eat gingerbread. Well, the teacher got a different idea. She decided to take the whole thing to Children’s Hospital, so the class didn’t get any of it… including Danny. He came home hungry! I loved to make bread, and had a very special recipe for rye bread.. My family loved that bread. One of the four loaves would be devoured as soon as it came out of the oven…and the other three loaves didn’t last long with three hungry teenagers. I finally gave up on trying to keep that bread on hand. You might want to try my bun recipe. 2 teaspoons sugar ) Let set and rise. 2 cups boiling water ) Let cool some. Let rise a couple of times and make into buns and let rise until quite light. Bake 350 F about 15 to 20 minutes. 60 buns. Hi, Norma – I think 62 years of traditional baking is something to celebrate. 🙂 Personally, I pretty much stopped all kinds of baking after the marriage split-up. There’s something wonderfully homey about baking and I miss that. We have our memories though – lots of wonderful ones! PS and thank you for the recipe! How good to hear from you. I’m sorry that you’ll miss out on the holiday baking this year, but I’ve pretty much turned that over to my daughters. Now we’ll have to try your buns recipe. Thanks for sharing. 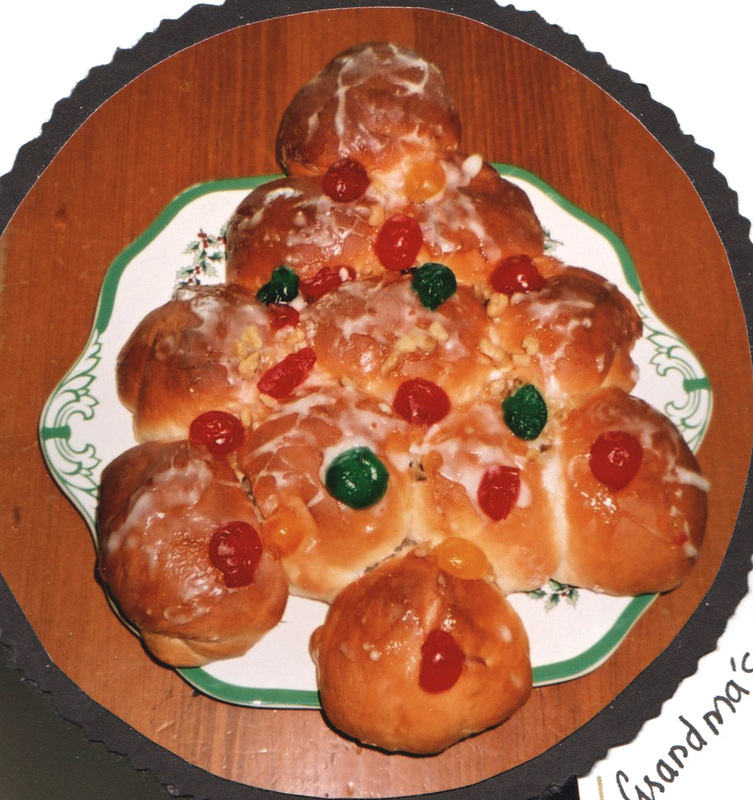 Certain recipes are inextricably linked with our Christmas memories, aren’t they? I bake a *lot* less than I used to, but am happy to benefit by the baking efforts of my family who have added some of my traditional recipes to their list of seasonal favourites. How wonderful to have visits from all of you! I have missed you. Guess I better get the kettle on and we can all have tea. Thanks for coming, and especially for your comments. Thank you! I appreciate being reblogged… first time! I’m sorry you won’t manage your baking this year, but look on it as having earned a rest after 62 years! We rather gave up on the Christmas Cake when the girls left home, but husband has kindly made a rich fruit cake and we’ll be feeding it with brandy till Christmas Day. We’re not going to do the almond paste and royal icing this year as we’re a bit rushed with trying to clear our old home. Maybe we’ll re-instate that ritual next year! 😉 Thank you for a lovely post, must admit I did smile when I read your story about Danny and the gingerbread cake! Best wishes from Liverpool. Thanks for your visit all the way from Liverpool. I do appreciate you comment. Time for tea? I’ll put the kettle on! The pictures of your desserts look wonderful, I wish I was that talented to make beautiful looking treats, I basically stick to the basics. Derek and his friends say I am the best cookie baker around, so I will stick to what I know. I am glad to see you back on the blogging, it must mean you are feeling a little better, which is awesome news. Take care. Dear Daria, Thanks for your visit… and yes, I am getting a bit stronger as day goes by. It was so good to see you when you came for Danny’s Celebration of life. I almost forgot… do you have time for tea? The kettle is on! I have time for tea, please, MomM! With just a wee gloop of cream if you have it, but no trouble if you don’t. It’s wonderful to see you writing, and thank you for the recipe. I will definitely give it a try. Boy that looks tasty! I know I am too late for tea but I can still imagine how good that would taste!